Poisoned Legacy? : Patty Clary of Californians for Alternatives to Toxics. WHEN PATTY CLARY gazes upon the picturesque vineyards of Sonoma and Napa counties, she sees beyond the rustic scenery of the popular tourist magnet and desirable real estate into what she warns is "a dirty little secret" the wine country keeps from its legions of admirers. "You can see these beautiful vineyards, but you may as well be in a factory town with smokestacks pumping out, because the area is full of pesticides that are invisible and odorless," she says. "Methyl bromide, for example, is completely odorless and completely invisible, but it's a neurotoxin that can, in subtle ways, permanently damage the nervous system." Clary, a member of Californians for Alternatives to Toxics (CAT), an Arcata-based environmental organization, has authored a new report that highlights some startling, and scary findings about pesticide use in wine country vineyards. The report--based on figures supplied by the growers themselves--claims that toxic chemicals are being used dangerously close to schools, homes, and winery tasting rooms. The report, "Time for a Change: Pesticides and Wine Grapes in Sonoma and Napa Counties," details pesticide use farm by farm, focusing solely on premium wine grapes. It relies on government documentation, such as pesticide-use reports supplied by growers to agricultural commissioners in each county, reports that are public information in California. "What emerges is a portrait of a lucrative industry heavily reliant on industrial poisons," Clary says. An earlier report, "Rising Toxic Tide: Pesticide Use in California, 1991-95," released September 18 by the Pesticide Action Network, found that in that five-year period pesticide use statewide increased 31 percent. At 49 pounds of pesticides per harvested acre, Sonoma County vineyards ranked sixth in the state overall in the intensity of use, twice the state average. State agricultural officials have dismissed both reports as "misleading." The 42-page CAT report further identifies patterns of use, including agricultural trends and public health risks. For example, one grower may use an abundance of pesticides for a grape crop, whereas a neighboring grower--faced with identical pests--may use fewer for the same crop. "One farmer may be better at controlling with fewer pesticides while another is overly reliant," explains Clary. "There's no uniform amount. It's totally up to the vineyard manager." The most common pesticides used in Sonoma County vineyards during 1995--and not counting sulfur (which is the least toxic product) and methyl bromide (which is not applied regularly)--were mancozeb (25,167 pounds applied) and dimethoate (20,990 pounds applied), according to the CAT report. "These are among the most toxic pesticides allowed in the United States," says Clary. "Both are known cancer-causing chemicals that contaminate the air and are seriously bad." Another finding, she adds, indicates that many pesticides are being used near the Russian and Napa rivers, primary sources of drinking water. The report also found that, when looking at neighborhood clusters of vineyards in Sonoma County, at least 14 public schools--including preschools, elementary schools, and high schools--are located within a quarter or half mile of vineyards that use high rates of pesticides. "We discovered that methyl bromide has been used on school days, and that [the fumigant] comes out of the soil for a week after application," says Clary. "To find out that this is being used near schools is really upsetting." Methyl bromide--already the subject of a ban that takes effect in the next few years--is an acutely toxic gas that is pumped into a vineyard to kill harmful soil organisms. Sonoma County rancher Lee Martinelli last month decided not to apply methyl bromide to a vineyard near Apple Blossom School in Sebastopol after mounting pressure from concerned parents and school officials. However, Veda Federighi, a spokeswoman for the state's Department of Pesticide Regulation, downplays the CAT report, and calls it "misleading" because "proximity does not equal risk." She says the issue of pesticide use near schools is "problematic because people want zero risk for kids," and she adds that California has the strictest rules on methyl bromide use in the country. While the state has not studied the effects on the nervous systems or intelligence of students whose schools are near vineyards where toxins are sprayed, Federighi insists that pesticide use is tightly regulated. "We control pesticides not by pounds used but by the toxicity," she says. "These kind of reports ignore the most important element of risk, which is exposure. Growers can only use what's allowed on the label--the choice is theirs, but they can't apply it without controls. And if it's a restricted substance, they have to get a permit from the county agricultural commissioner." According to Federighi, after pharmaceuticals, pesticides are the most closely regulated chemicals in the state. "That's why we say they can be used safely," she says. "The adverse health effects demonstrated are always on animals that have been exposed to very high doses. These don't relate to exposures on people," she adds. But Clary says that efforts to trace pesticide damage in the body have proved difficult and expensive. "Doctors are very poorly prepared to recognize pesticide illness," she explains. "But signs can include flulike symptoms, asthma, dizziness, nervousness, stomach problems, and lung problems. We do know that the rate of cancer among children nationwide is increasing 1 percent per year, and experts say it's because of chemicals in the environment." Clary also points to recent research done in Lompoc Valley that suggests a correlation between drifting agricultural pesticides and increased respiratory illnesses among Lompoc residents. "Now, we've shown the main pesticides being used in Sonoma County are very toxic, so let's have a little common sense," she comments. "There are people living close to these vineyards, and there's going to be more suburban development. People want to live near vineyards and don't realize they're at risk." Clary also charges that the lucrative wine-grape industry contributes little of its profits to research on alternatives to hazardous chemicals. 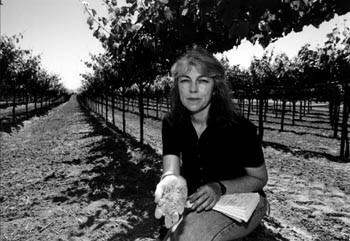 She suggests that winegrowers form a commission, tax themselves, and hire experts to help eliminate pesticides. "The biggest pesticide users are in denial," says Clary. "But with very little effort, the industry could change all this and remain a viable money-making enterprise." One Sonoma County grower, who declined to be named, called the CAT report "an out-and-out lie" and "a misrepresentation." And Pete Opatz, vice president of the Sonoma County Grape Growers Association and manager of Alexander Valley Vineyards, says that some of the figures used in the report don't jibe. "We're trying to figure out why some materials are overstated," he adds. Clary responds that all figures came from the county agricultural department. But Opatz says usage figures can be misleading. "Growers don't target an entire insect population at once, but use products that specifically target one type of bug, but that must be used more often," he says. "Also, we're also using a higher quantity of sulfur, which complies with organic farming practices." Although Opatz admits there are a "small amount of bad apples" in the industry, Opatz says most growers recognize their accountability. "Many growers are researching integrated pest management," he says, adding that a Sonoma County Grape Growers Association forum in January will include an educational program called "Agriculture's Responsibility in an Increasingly Urban Environment." Federighi says the state is encouraging farmers to use integrated pest management. "But we can't mandate that," she says. "We can just make a climate where farmers can develop their own solutions." Noting that the state has awarded $1 million in grants for farmers to find alternatives to pesticide use, she adds, "The wave of the future is integrated pest management, but it has to be homegrown. Farmers say there are immense risks involved in doing something different--it could mean a crop failure. So they are very slow to change." From the Nov. 13-19, 1997 issue of the Sonoma County Independent.